Mechanical pencils are exquisitely designed with an aluminum alloy barrel for those who want to make a statement. High-performance ink technology combines the best qualities of liquid and gel ink for a super-smooth writing experience. Experience greater writing control with the distinctive, textured grip. This unique, extra-soft, comb-like grip means less writing fatigue and more style. 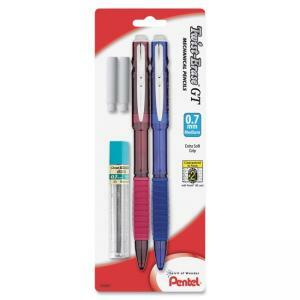 Frequent mistakes are no match for the larger than ordinary and long-lasting twist-up eraser. No smudges, no paper tears and no ghost with the twist-up eraser. Fully retractable writing tip protects pockets and purses. Durable metal clip withstands repeated use. 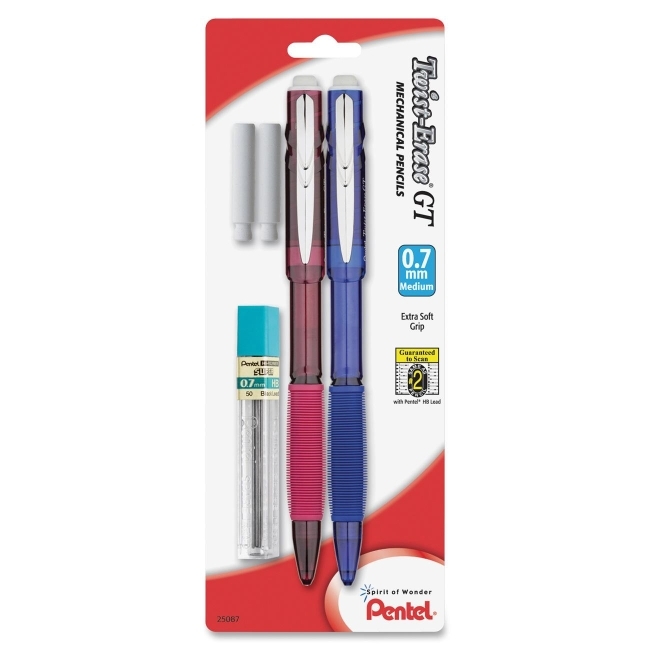 Twist-Erase GT Mechanical Pencils are pre-loaded with Pentel Super Hi-Polymer HB lead so it never needs sharpening. Super-strong lead produces a clear dark line and is guaranteed to scan on standardized tests. Set includes two assorted barrel color pencils, tube of HB lead and two eraser refills.